Choosing the best e-cigarette starter kit can sometimes be confusing for smokers. We have carefully selected some of our most popular e-cig starter kits to make it easy for you to start vaping. To help find your favourite flavour, we suggest you consider adding a Vapour2 Sampler Pack to your order. Sampler Packs contain Cartridges or E-Liquids in a range of different flavours, and are available in 4 different strengths; 1.8% is the most popular option for new vapers. Vapour2 Starter Pack: The most economic way to try multiple flavours to find your preferred flavour and correct nicotine strength. Vapour2 E-Liquid Vape Pen Pack: If you want the best value open system, then this is the most suitable option for you. 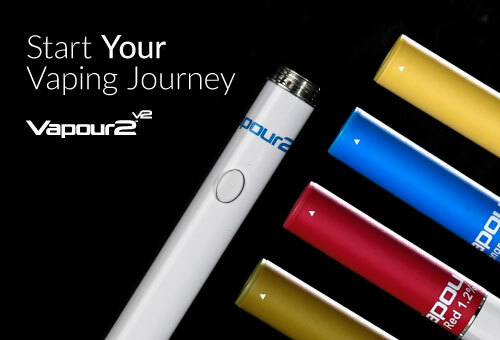 Vapour2 PRO Series 3 Vape Pen: Ideal vape pen capable of vaping e-liquid, loose leaf, dry herb and wax.